From Black Robes to Backpacks ! The fact that it was a travel group solely for women piqued my interest. On a whim I decided to sign up for one of their upcoming trips. 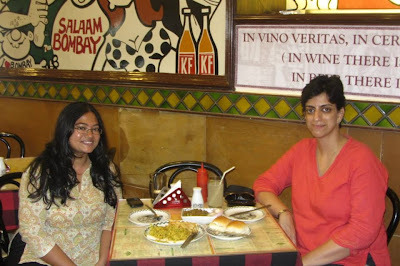 It was during that trip that I first met Piya Bose, the founder of GOTG. Soft spoken and polite, with a smile that lights up her entire face, Piya with her zest for adventure is a delight to travel with. Over the years an easy friendship developed between us and listening to her tell me how and why she started GOTG, just reinstated my belief that if you have enough passion and conviction you can do just about anything. So, when I was asked to write about a Woman Entrepreneur, I couldn't think of a better person than her! Piya was first bitten by the travel bug when she went to South America on Rotary Exchange at the age of 16. It was during this trip that she realized that traveling was what made her the most happy. On her return however, she followed the conventional path and went on to graduate in Law from the prestigious National University of Juridical Sciences. She started her career at one of the top law firms in India. Most people would kill for such a lucrative job, but Piya spent all her spare time researching travel destinations and doing interesting things like figuring out ways to travel from London to India by road. (yes she actually made a road map for this!) The desk job made her restless and she knew for certain that she didn’t want to spend her days sitting in front of the computer, doing graveyard shifts for the rest of her life. A chance trip to Lucknow was to be the turning point in her life. From Lucknow she took a spur of the moment decision to travel to Nepal and once there she realized that there were tour operators actually offering trips into Tibet. On a whim she decided to pull out all her savings and take an impromptu trip to Tibet. Her moment of epiphany came as she stood facing the majestic Mt Everest. That was the moment she decided that she wanted to do something meaningful and different in her life. Through her solo travels Piya had observed that not many Indian women travelled on their own. Usually they travelled with their families and with them they were still playing their roles of a wife or a mother or a daughter. She felt women had no opportunities to just let down their hair, enjoy and be themselves. Also, women who did want to travel alone were hesitant to do so because of safety issues. Piya decided she wanted to change that. And so in 2008, Girls on The Go – An exclusive all women’s travel group was born. For all her love for travel, Piya had no experience at all about the travel Industry. All she had was a dream and the conviction to follow it. Since she had just come back from Tibet she decided to put her knowledge of high altitude travel to good use and decided upon Ladakh as her first travel destination. With no money or resources, she banked on her ingenuity to make this trip a success. She started off by putting advertisements in travel magazines and social media groups. All the while she researched as much as she could about the destination. Within three months she had a total of 26 ladies who wanted to travel with her. That trip was a resounding success and Girls on the Go has never looked back since. I have traveled many times with Piya and the sheer dedication and hard work that she puts into each and every trip is evident. Her ground work is thorough, her planning is impeccable and her trips run smoothly and flawlessly. What sets Girls on the Go apart from rest of the travel groups is that it doesn't just herd people together, book hotels and send them off. Piya connects with each client individually before and during the trip to understand their needs and this goes a long way in building positive relationships. The itinerary is planned not from a financial angle but by keeping the interests and comfort of the group in mind. Apart from the excellent manner in which she runs her operations, innovation and thinking out of the box is her USP. I remember on trip to Ajanta Ellora, Instead of the usual tourist guide, she got members of the Archaeological survey of India to explain the history of the paintings to us. During that trip we also went to Lonar lake, a destination most of the travel companies are not even aware of. And we had a guide who has actually worked with the NASA physicists explain the nature of this lake that was actually created by a meteor. Her passion for exploring different cultures, architecture, art and food makes her trips very enriching. Her trips are filled with interesting activities from mud spas, heritage walks of Old Havelis in Rajasthan, cooking local cuisine in Bali, sailing down rivers in Vietnam to staying on the banks of a lake deep in Ladakh. Although women travel as a group, she makes sure that they also have enough time and opportunity to just be by themselves and do things individually. Needless to say, Girls on the Go is now one of the most successful Women Travel groups in India. Piya has been featured in many newspapers and magazines. She was also invited to speak at a TEDx event. In her pursuit to make a difference in the lives of people and work towards a social cause, Piya is also working on a travel venture for differently abled people. When we talk of successful women entrepreneurs we usually think of women who have started an enterprise in the face of extreme personal adversity. But to follow your passion, to abandon a bright career to tread on a path that you have never walked on before also needs courage and great self belief. All of us have dreams, but how many of us give up our comfortable lives to follow those dreams. And that too, to not work simply for the financial benefit for it, but in order to make a difference in the lives of others. This in my eyes is what true entrepreneurship and nurturing independence is all about. Piya and I - Fellow Travelers and foodies ! Thanks for sharing the story of Piya,it gives the energy to follow ones dreams. I liked your style of writing, it kept me hooked on till the end. Following you for more wonderful posts. welcome here Arjun.I am glad you liked the post. I really envy her spirit. Travelling, visiting different countries, knowing their cultures, tasting their food, living through their nature and connecting with people, knowing the history- all these are such a character building activities. I too love to travel, but I am a bit anxious to travel on my own for vacations. for business trips, I have no choice and I travel all by myself. My first travel by flight has completely scared me out as it was not a very good experience. But it is always good to face the fear. I would love to travel myself one day. Best wishes for her group and best wishes to you for the contest. You are so right Bhavana. Experiencing different cultures and societies is indeed a life changing thing ! I love travelling solo - although I am a bit anxious to do it within India ! Thank you for your wishes ! Awesome. Hope to take a trip with her one day. Maybe you can join too. I have my next sabbatical coming up in 2015, so I'll try to plan something for myself (sans hubby/kids) with her. Look forward to travelling with you then ! Thank you Arvind. Glad you liked it ! Superb venture and loved your writing style and portrayal, Ruchira! Will surely recommend Girls on the Go to my friends. Now that sounds like such an interesting and useful venture. Indeed, women do not enjoy traveling alone in this country and to have their needs taken care of and their travels made safe and secure is really wonderful. Great job, Piya! And thanks for sharing info on Girls on the Go, Ruchira! You are welcome Rachna. GOTG indeed makes travelling very easy and interesting ! This is such a wonderful post. Piya is a FB friend, and I loved reading about what she has created. Glad you liked it Ritu ! Super post. Will remember GOTG when I want to travel in India. thanks for sharing. welcome Suzy. I am sure you will enjoy travelling with GOTG. That is one inspiring story Ruchira. There are just a few who actually get to chuck their mundane jobs and follow their dreams. Loved this story so much. You will love travelling with them.You are right only a few chuck their jobs to do what they actually want. That's why their story is so inspiring. Wow. That is some true story I have read in a while. Love the title, and it says it all. I like this - "figuring out ways to travel from London to India by road. (yes she actually made a road map for this!)" - and would LOVE to do it, with you and her and more women like you both! :) Beautifully written about a wonderfully inspiring person, Ruchira. Well-done, ladies!! Wow!! This is so inspiring... Thank you for sharing the story of Priya and GOTG!! If you've got a dream and are passionate about it just listen to your heart, believe in yourself and have the courage!! Now I really want to go on a solo trip with GOTG! Welcome here Aditi and I am glad you liked what you read !I think listening to your heart always helps ! I Really appreciate Piya and wish her many more journeys and I wish she explores and enjoys life more every day and helps others to do the same :)! Yes Piya and GOTG are doing a wonderful job ! I love your choice! I am dreaming of the time when I will make my first trip with them :) Three cheers to Piya for GOTG. Thank you Shail. You would love travelling with GOTG. How gratifying it is to find resonance with someone you can also admire. Wonderful write Ruchira! I recall having seen her on Richa's programme. Tell me,is there one MOG? Yes, she was there on Richa's prg. I don't really know what MOG is ! I had no idea that such a group exists in India and is successful too. This is such a great concept! It sure is a great concept and is catching on like wildfire ! How inspiring! when I met Piya last, I did not know about her venture. Thsi is a revelation and am I glad! I am sure you would enjoy the trip ! So very brave to just chuck the well-trodden path and forge her own!! Such a well written article. Thank you for sharing the inspiration. May be Yes, May Be No, May be I don’t know ! Sponsored Video: Lifebuoy Help a child reach 5 !